Different indoor environments have different air cleaning needs. IQAir has custom designed specific air purifier models to target specific groups of air pollutants. This approach maximizes effectiveness and minimizes cost. IQAir individually tests each stand-alone air purifier to ensure that its performance meets its strict specifications. 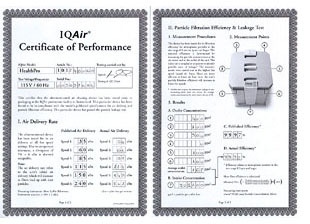 The results of the tests are detailed in a hand-signed Certificate of Performance, which ships with every air purifier. IQAir's "fan-in-center" design places the fan motor in-between sound attenuating filters. The double-walled housing effectively reduces sound transmission. Rubber suspension pads systematically isolate motor vibration from the air cleaner housing. The result is an air purifier quiet enough for even the most noise sensitive environments. Every IQAir stand-alone air purifier features six fan speeds and allows you to program the system for automatic operation via a day/night timer. The intelligent filter life monitor precisely forecasts filter replacement based on actual usage. A sleek remote control allows you to operate the air purifier from afar. In addition to removing pollution particles, such as dust, bacteria and viruses, select IQAir models are highly effective in remove molecular air pollutants, such as volatile organic compounds (VOCs) and other gaseous chemicals and unpleasant odors. Six Speed Settings - Most air cleaners provide only two or three fan speed settings. This often leaves you with two choices. Either you run the unit at a quiet, but ineffective fan speed, or you choose a more powerful, but too noisy speed. The HealthPro gives you the choice of six fan speeds, allowing you to select the ideal performance-to-sound ratio. Integrated Timer - Program the HealthPro to turn itself on and off based on your lifestyle. Set the unit to run during office hours or program it in your bedroom to go on after you have reached deep slumber. Remote Control - Permits on/off, fan speed selection and timer activation from as far as 30 feet away. 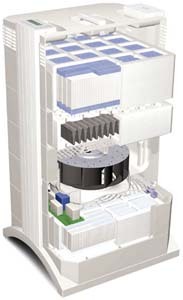 The patented modular IQAir housing lets you replace filters in a matter of seconds. Simply pull the unit's two pivoted levers outward. Like magic, the upper part of the unit lifts ... ... and releases the housing modules that contain the filter elements. IQAir's modular design takes advantage of independent multi-stage filtration. 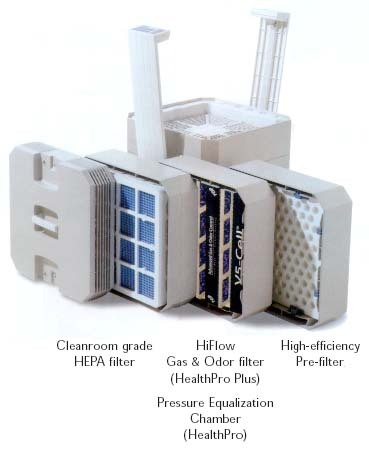 Each filter is contained in a separate filter element (HealthPro Plus pictured). Many conventional air cleaners feature some type of activated carbon filter for the control of gaseous pollutants or odors. There are two common types of activated carbon filters. The least efficient consist of activated carbon pads where carbon dust is glued to the surface of a synthetic fiber pad. The second type, granular carbon, is more efficient in absorbing gases and odors. Unfortunately, granular carbon drastically reduces the airflow capacity of air cleaners, making them less effective in improving your indoor air quality. The HealthPro Plus uses revolutionary V5-Cell Technology to provide superior removal of gaseous pollutants and odors. Rather than using common activated carbon, the V5-Cell uses a special five pound blend of broad-spectrum gas and odor control media. As a result, the HealthPro Plus is able to trap a broader range of gaseous contaminants and odors than conventional room air purifiers. The V-shaped media chambers allow for higher airflow than comparable units. Contains particulates and gaseous contaminates 1. Eliminates over 90% of all the particle mass. This prolongs the life of the subsequent filters. 2. Absorbs over 200 gaseous pollutants and odors, especially volatile organic compounds (VOCs). 3. Traps small and ultra-small particles, including bacteria, viruses, allergens and sub-micron sized dust. Guaranteed over 99% particle-free.